This 8.5-inch by 11-inch perforated paper configuration was designed with printing church bulletins, invoices, payment receipts, and more in mind! Thanks to micro-perforation, its 3.5" bottom margin is easy to separate, leaving a piece measuring 7.5 inches tall by 8.5 inches wide. Layout is perfed in 1 column by 1 row with a 3.5" bottom margin. Print church bulletins, invoices, payment receipts, or registration receipts on your printer or copy machine. Available in several different card stocks and colors. Top quality at an affordable price. Have an office project? 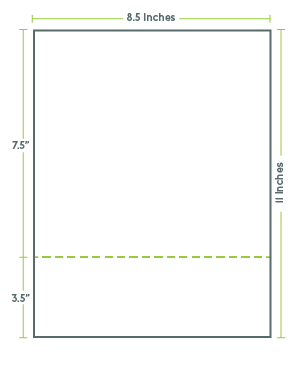 Browse PerforatedPaper.com to find the perforated card layout you need or create your own!